Gregory gives Impromptu concert on Bach's birthday. Dr. Hamilton gave an impromptu concert of Bach organ works at Holy Trinity Seminary, on Bach's birthday. A comment from Dr. Andrew Mead - Professor of Composition and Theory at The University of Michigan. much. Haven't gotten to the rest yet, but will write when I do." The first CD is a projected series of recording of the music if Dom Paul Benoit will soon be released on RosaMystica Records.The CD is in the final stages of production, and was recorded on the Ross King Organs at Holy Trinity Seminary. Stay Tuned for availability. The NPR show "Pipedreams" features performances from the 2016 American Guild of Organists convention in Houston. One of the featured performances is "Fanfare on Castlewood" played beautifully by organist Chase Loomer at the Catherdral of the Sacred Heart. Morceau de Lecture a Vue pour les Examens de piano de l'Ecole Normale de Musique. From Messiaen; Peter Hill and Nigel Simone: "Messiaen's military service continued through the summer of 1934. During this time, he composed examination pieces for the Ecole Normale, including sight-reading tests (as he reported to Arrieu on 23 july). At least one of these sight-reading pieces has been published: twenty bars long and marked "Lent, expressif", the Morceau de lecture a vue pour les Examens de piano de l'Ecole Normale de Musique: Déchiffrage I appeared as the musical suppliment in Le Monde musical for October 31, 1934". There are quite a few new works and premiers this year from Gregory. Lorenz Publishers continues to regularly publish organ works, for its regular and special publications; The Organist, and The Sacred Organ Journal, over 20 works have been featured. Composer/Organist Dr. Gregory Hamilton (Dallas AGO member) World Library brought out Ten Gregorian Preludes, Cantica Nova will be bringing out a volume of Alternate Hymn Harmonizations, and Parclete Press will publish I Wonder as I Wander (for SATB, piano and flute). Fanfare: Come to us Creative Spirit (CASTLEWOOD), Prelude PECAN STREET and PESCOR DE HOMBRES. Houston organist Jackson Osborn will premiere a large organ work: In Nomine, a variation and fugue work based on the In Nomine by Thomas Tallis. 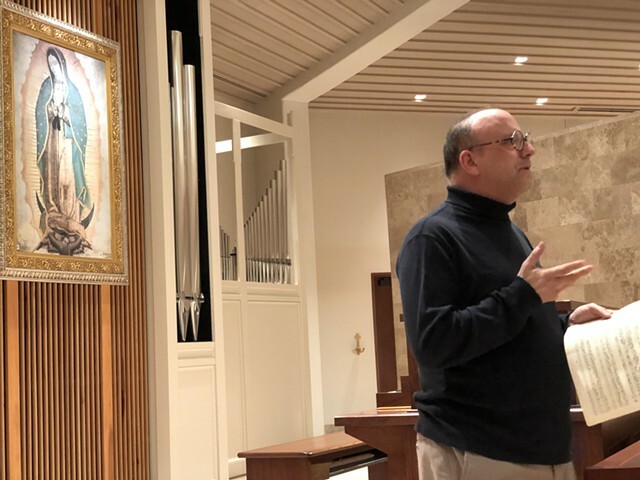 In addition, he presented a Lenten recital for St. Thomas Aquinas Church in Dallas, (Michael Conrady, Music Director) of works by Dom Paul Benoit. Hymn of Peace, for Cello and Piano, performed by Diane Winder, Cello, and the composer, piano. "Jubilate Deo" for organ, by Dom Paul Beoit; from the upcoming release on Rosa Mystica Recordings. Videos form "Cupids New Arms of Love"- the Orchestra of New Spain - A great production. Gregory is playing theorbo in the orchestra. Three winning pieces by Gregory have been selected for AGO (American Guild of Organists) Houston 2016 Bayoubüchlein Competition. The three pieces are organ works on 20th century tunes' Castlewood" "Pecan Street", and "Pescorores des Hombres". All three will be published in the upcoming volume by Selah publishers, and Castlewood will be performed at the AGO conference in June. Virtuoso organist Jackson Osborne will present a recital at the Santa fe NM National Winter Conference presented by the St. Basil School of Chant".(St. Thomas university, Houston) The concert will take place 7:30 February 2nd at First Presbyterian Church in Santa fe. Mr. Osborn will present a new organ work by Hamilton, "In Nomine", which is is an extended organ work on the theme of "In Nomine" by Thomas Tallis. The work may be found on the Sheet Music Plus site. This marks the fifth work that Mr. Osborn has premiered by Hamilton, thank you Jackson! Kudos to the great creative work Mr. Jackson and Mr. Lovell are doing for Sacred Music. Paraclete press will publish "I Wonder as I Wander" for SATB, flute and piano (Organ). A large portion of Gregory's works are available as instant downloads on Sheet Music plus. Organ works, chamber music from the Illuminations CD, piano and orchestral music, hymn arrangements etc! Houston virtuoso Jackson Osborn gave a wonderful premier performance of the work he commissioned from Gregory, z%Three Trios on Immensa Trinitas. %Three three voice trios on the Trinity! The cantus firmus migrates from the bass in the first trio to the middle voice Tierce en taille, to the top voice in the last trio. The work was given the usual Osborn panache as well as fine performance of works by Bach. Tournimiere and others. The recital was given at Holy Trinity Seminary on the new Ross King organ. The Lorenz company has published over a dozen of Hamilton's works this year. A wide variety of organ music has been released, from hymn-based preludes, to variations and free works for liturgy or concert. Thanks to Douglas Wagner, editor. World Library has just released 10 Chant preludes for organ in its organ music series. The publication features accessible arrangements of the most well known chant tunes - eternal music. Gregory has been named 'composer in residence' at all Saints parish, Don Essmiller music director. All Saints Parish in Dallas has one of the most highly developed and cultured music programs in the city, and is widely considered a model for the Catholic Liturgy. Dr. Hamilton has written a number of new works for All Saints, including a new choral arrangement of "Lo How a Rose" premiered this past Christmas, as well as orchestrations for full orchestra and choir of hymns and liturgical music. WLP (also J. Paulach) will be bringing out a volume of works by Gregory for organ, based on Gregorian Chant. The works are intended to introduce organists to chant, and include a variety of styles suited for the intermediate organist. Publication date to be announced. Virtuoso Organist Jackson Osbourne will present a major new organ work by Gregory Hamilton. The new work is titled Three Psalm Pictures, Second Set and is the second set of these compositions for organ. The premiere is part of Mr. Osbourne's concert in May 20th, 2012 at Our Lady of Walsingham Church in Houston Tx. Other works will be by Ropek, Langlais and Bach. Stay tuned for more details. A collection of original hymn-tune preludes. This marks the third collection of piano music of Gregory's to be published by Augsburg. Dr. Hamilton played the re-dedication recital on the 1923 kilgen organ at St. Mary's of the Assumption church in Fort Worth tx. The organ, one of the last remaining historic organs inFort Worth was restored by the Roy Redmond organ company. Organ Rededication in Mckinney Texas. On April 3rd 2011 at 6:00, St. Michaels' Church in Mckinney Tx. hosts the rededication of their fine Ross King organ. Featured artists are music director Valerie Stagaman, Donald Fishel, flute and many others. A new work for piano; "The Lamentation" was premiered on March 16th 2011 at the University of Dallas. The work is an extended reflection (15 min) on the Icon of the Lamentation. Stay tuned for other performances. CD by Gregory Hamilton Released! A new cd by Gregory had been released on RosaMystica! Dr. Hamilton is now accepting commissions for new compositions from churches, schools choirs, chamber ensembles, orchestras and solo instrumentalists. Feel free to contact me to chat about your project and make it a reality! Five Psalm Pictures received world premiere. received their world premiere at St. Theresa church in July of '08. The colorful pieces were well received by the appreciative audience. Gregory also played American works by University of Michigan composer James Aikman (Postlude a world premiere), Charles Callahan and also early American keyboard music from the 18th century. The Five Psalm Pictures have been performed in Ann Arbor as part of the AGP festival. Also, Marilyn Mason's students performed Prelude for Madame in a program of music dedicated to and commissioned by her. We had excellent attendance at my recent recital at St. Theresa Church; "The Symphonic Organ" which featured works of Bach, Dale Wood, Dom Paul Benoit and Cesar Franck. Many thanks to those in attendance! I conducted my commissioned arrangement of "The Church's One Foundation for the opening Processional in April 08 for the Dedication Mass at the Cathedral of the Sacred Heart in Houston. The setting is scored for full orchestra, and choir, and includes choral settings of the Introits for the Dedication of a Church. With an orchestra of 60, a choir of 110 plus organ and 2000+ congregation, it was a literal blast. The setting is 12 min., and I recived many kind and gracious comments from the choir and orchestra members. Also, I conducted the world premiere of Naji Hakim's Megalanarion of Pacha with the Dedication Choir. Congratulations to the other directors; Kevin Klotz, Chris Popelka, Sarah Black and all who participated in this historic event! to a large a receptive crowd. Several of the concerts also featured the church's beautiful 1985 Hubbard Harpsichord. Dr. Hamilton has been appointed music director for the Rome Pilgrimage Choir, which is travelling to Rome, for the Costistuery mass for Archbishop Daniel deNardo, who has been named a Cardinal. There will be a number of masses with the choir, including a mass at the historic Basilica of St. Mary Maggiore. Choral works will include Ubi Caritas by Durufle and Ave Verum by William Byrd. In September, Gregory was invited to present an organ recital at St. Benedict's Abbey, in Atchison Kansas. The recital was part of the abbey's 100 year Centenary Festival The Abbot of St. Benedict's was a cantor in the Veni Creator suite by DeGringny. Gregory also performed a recent work Fantasia: Amazing Grace. The duo will also perform the cycle for the 45th University of Michigan Organ Conference, October 1st.